With a few minor distractions and detours on its path, Falling into the Mob accomplishes this goal. The idea that the author’s creativity sparking this book arose from a serendipitous real-life event is captivating. And as the plot unfolds this fact is even more impressive. Zousmer weaves a tale that at times appears to be outlandish—but that is also part of its charm and witticism. The main character Philip Vail has had a successful career as a freelance speechwriter. As he approaches 60, his client list has pared down, and he has lost the zeal for writing speeches for corporate executives. At a crossroads he begins a period of self-reflection and realizes his house is not only empty but so is his life. His remaining client Peter Draybin, a career CEO, decides to run for the office of President of the United States. He would like Philip to join his team as a speechwriter. Though bored at the prospect of this new position for a brief period he indulges the whims of the candidate. And then, lo and behold, Phil, while riding the train home one night has an encounter with an alluring stranger that will dramatically change his life. Her name is Sylvia Sforza and he quickly realizes she’s not only gorgeous but strong and powerful as well. The attraction is almost immediate, but he has little expectation that she would be attracted to him. Another chance but unpleasant encounter occurs on the train that involves a collision with a group of angry young men. To demonstrate their physical prowess, it becomes clear that they definitely are a force to be reckoned with. While trying their best to intimidate Phil, they continue to threaten bodily harm that will end with a stay in the intensive care unit nearby. And just when another confrontation arose, out of nowhere an SUV arrives and whisks Sylvia and Phil far away from the mean, dark city streets. But who were these men that rescued them? And why is Sylvia so friendly but commanding with them? The simple answer is that these men are a faction of a major mafia organization, and atop the throne is Sylvia’s ailing father. This revelation and his adoration for Sylvia will change Phil’s life forever. He has a major choice to make that will dictate whether he stays on the straight and safe path writing speeches or immerses himself in the foreign aura of the mafia world. With all the positives of Falling into the Mob, there are a few imperfections. The plethora of mob characters though often colorful can appear to some readers as both stereotypical and archetypal reminiscent of films like The Godfather and Goodfellas. As a caricature of the mob it works and its dark humor does succeed. 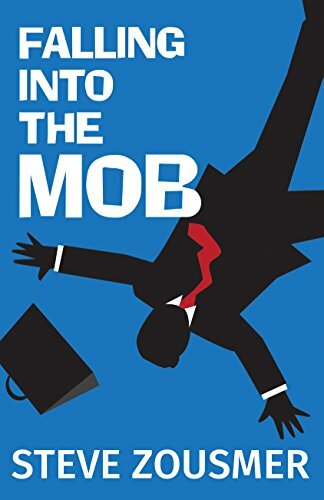 Falling into the Mob certainly provides a surfeit of action and excitement, but the overabundance of ancillary characters without a substantive background of each one promulgates confusion. Additionally the transitions between subplots could be smoother as characters are woven in and exit. As a crescendo slowly builds to a dramatic conclusion the reader wonders if the main character’s two distinct lives will collide and if so, what will be the outcome of that clash? But alas, only by reading the final paragraph will that question be answered. Laura Schultz has been a licensed psychotherapist for over 25 years as well as a freelance writer published in myriad genres. She currently writes articles in a national magazine on a variety of contemporary topics. She is the founder of Writer’s Etc. which is an international group merging writers of all genres including nonfiction and general fiction, biographies etc. together with the Hollywood community. Additionally she has been a professional reviewer of numerous genres including nonfiction, contemporary fiction, biographies, and true crime.